London: Pr. by Charles Bill, & the Executrix of Thomas Newcomb, 1709. 12mo (15.5 cm; 6.125"). 113,  pp.,  ff. ; 44 pp.,  ff. 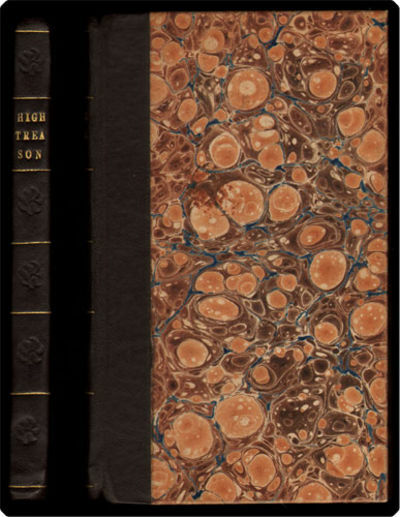 Publication of this treatise on high treason followed hard on the heels of the Treason Act 1708 (7 Ann c 21), by which Parliament "harmonized" the laws of high treason in "Great Britain" following the union in 1707 of England and Scotland, each of which had different and sometimes quite distinct concepts of "high treason." The final part of this small volume bears a title-page reading "A form and method of trial of commoners, in cases of high treason, and misprision of high treason," with the same imprint information at the main title. (A woman tried and convicted, seeking a stay of execution because pregnant, may pray "a Jury of  Matrons or Motherly Women" confirm and attest the same; other data are equally particular and evocative.) While the pagination and signature markings of this final part are not continuous from A collection of several statutes, it is clear that the "two" were printed as a whole and are not separate works, although they are sometimes catalogued as if they were and are even sometimes sold as such.